When cleaning carpets, it is important to know the type of carpet fiber and the type of soils present to choose the right chemistry for the job. One of the factors that affects carpets over time is the pH of your carpet cleaning chemicals. This determines how effectively the chemical can remove the spots or soils present, and can potentially damage carpet fibers in some cases. In addition to the pH, you should also consider the other ingredients in the product that can impact the carpet’s pH, which includes stabilizing solutions known as buffers. In order to prevent carpet color loss and browning, Whittaker keeps the pH of CRYSTAL DRY® Extra and CRYSTAL® QUICK RESTORE™ safely under 9.0 and our chemistry largely unbuffered. The pH scale ranges from 0-14, with 7 being neutral. A pH under 7 is more acidic, while a pH over 7 is more alkaline. Very alkaline carpet cleaners, meaning those with a pH of more than 9.0, can have an impact on carpet color. According to WoolSafe, high alkalinity can cause multi-colored patterns with multiple dyes and pigments to bleed, and natural wool fibers may yellow. With wool, sisal, cotton, or jute-backed carpets, a high pH cleaner can worsen cellulosic browning, which causes brown spots to arise after cleaning. When a carpet is repeatedly cleaned with high pH chemicals, a sticky residue is almost always left behind. These residues trap soil, hurting the carpet’s appearance and making it more difficult to clean. In some cases, the carpet will actually reach a pH as high as the chemical residue left behind limiting the release of soil during cleaning. Although the overall pH is important, choosing a carpet cleaning solution solely on the basis of pH alone is not good enough. Carpet cleaning solutions include many ingredients, and these ingredients called buffers can contribute to raising or lowering the pH of your carpet over time. 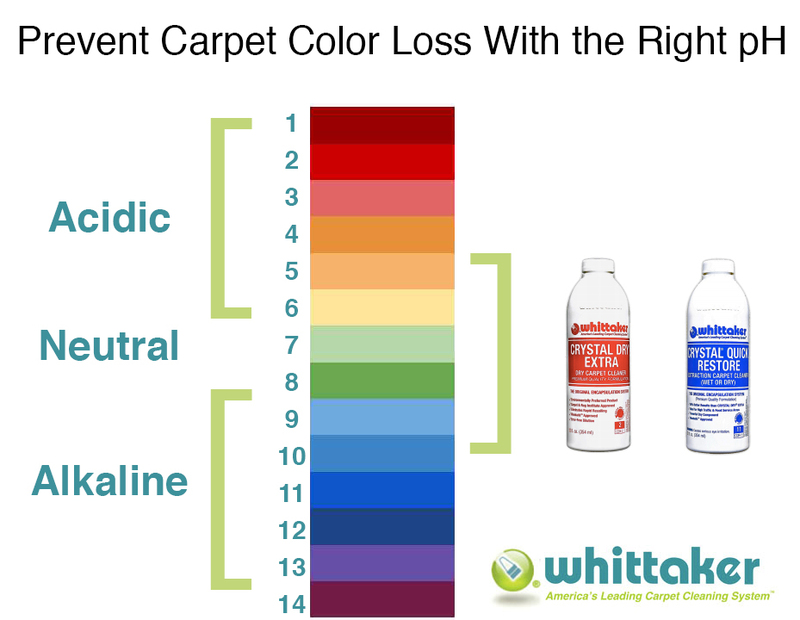 In order to protect your carpet appearance and your facility, stick with neutral or slightly acidic chemicals in the pH range of 5.0-9.0 and with few buffers like Whittaker’s Crystal® chemistry products. 1"The Wool Carpet Cleaner's Manual, Eric Brown, WoolSafe Organization. Making sure that every square foot of carpet adds to the beauty of a facility as its manufacturers, architects, designers, and installers intended.